Brings enthusiasm, motivation & a 'zest' for living your life to its fullest every day free from restraint! Welcome to the new confident and outgoing you! Bring back the 'zest' in your life to become a more dynamic person and start living your life to the fullest. Create meaningful and fulfilling relationships with other people in your life and enjoy the satisfaction of waking up every day looking forward to what it will bring. This CD is especially useful if you are an 'introverted' personality type and wish to 'break out of your shell' to start benefiting from a more 'extroverted' approach to your life. The beneficial suggestions contained in the spoken hypnotic script will bring permanent and positive change in the way you view yourself and the way you interact with others, to help you achieve the life that you know you want. Learn to release the emotions causing you to lack motivation and turn them into inspired motivation to help head towards what you really want. Develop the confidence and 'get up and go' to get back on the right track in life. 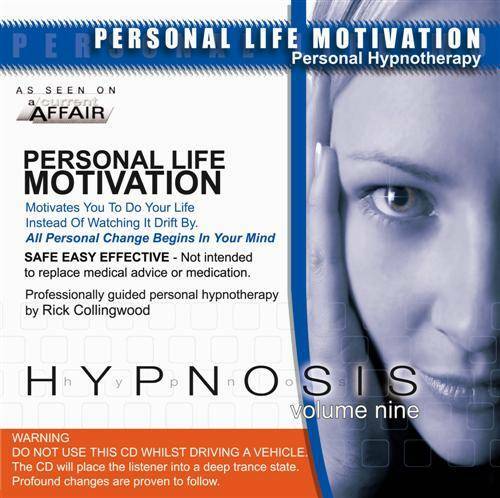 If you suffer from lack of motivation and just don't feel like doing anything with yourself in general, this hypnosis CD is your chance to break this pattern. It will allow you to delve deep inside inside your mind to rewrite this self defeating attitude into positive personal development. Better still - you don't have to do anything except sit or lie back, drift away and experience the world's most powerful deep relaxation recorded session to make the change you want. This is a powerful hypnotherapy program. Many people have used this with incredible results. Always remember - there is a light at the end of every tunnel. No matter how depressed, bored or unmotivated you are, there is an alternative. Try it for yourself today... you will be surprised by the results. It just takes one choice or decision to begin personal change and the first step is always the hardest. But changing something you do today by as little 1% can make a 100% difference down the journey that is your life!